I have read quite a few posts recently on social media about how many Dental Front Office Teams are throwing their hands up in the air trying to find a way to successfully follow up patients who have no ongoing appointments made. From many years of learning the hard way I worked out that the best time to make the next appointment is when the patient has just been in for an appointment and is standing or sitting right there in front of you. This could either be for their next Hygiene Preventive Care Appointment or their appointment with the Dentist to continue their restorative treatment. When the patient does not make their next appointment and leaves your office your chances of being successful in making another appointment drop about 50%. The very best opportunity to successfully make an appointment is straight away when the patient is right there in front of you rather than later on on the phone. Once your patient leaves your Dental Office they begin the process of believing everything will be OK when in actual fact everything will not be OK! 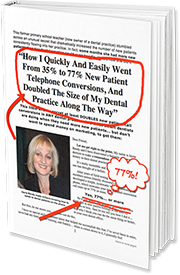 The longer your patient goes without making that next appointment, the closer they go to becoming the dreaded inactive patient at your Practice. Rewind, and the answer to solving your patient follow up nightmare is right in front of you. The time consuming task of following up our patients is often in the rewind of what was missing back at their last appointment. Did your patient understand the urgency to return for further treatment? Did your patient have a compelling reason to come back? Did you create a relationship of trust and belief with the patient? Did all these things happen with your patient at their last appointment? If these things did not happen then this is the main reason your patient did not make that next appointment. You know when you have been successful because your patient will have made their next appointment and better still, they will be fully committed to their appointment. Was there a particular reason of concern raised to ensure your patient continued their treatment or made their next Hygiene Appointment? If you have developed a trusting relationship with your patient, this too will help to ensure your patient makes their next appointment. I know this doesn’t help your problem now but it sure does help the problem tomorrow! Be careful how much time you spend worrying and trying to fix what is broken now. Reduce patient follow up and come up with the strategies for what you are missing to ensure that your patients are making their next appointment and not becoming inactive patients. It can be a vicious cycle you don’t want to get into!